Paratesticular leiomyosarcomas usually involve testicular tunics or spermatic cord. Rarely they arise in the epididymis, scrotal subcutis or dartos muscles. The case shown here was centered around spermatic cord in a 79 y/o male. Atrophic seminiferous tubules are seen on the upper right. 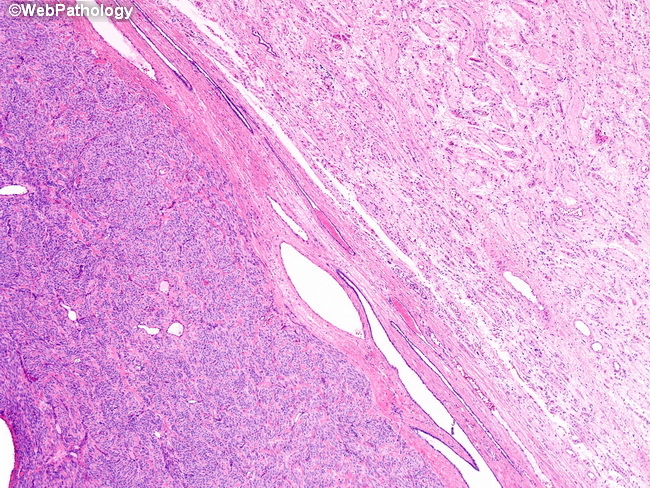 The tumor is seen on the left half of the image. The tubular structures in between the two areas represent rete testis.